Polygamy gets a bad rap these days: It subjugates women; it creates a hostile environment for families; it is practiced by religious nut jobs; it is often associated with child marriages to older men. . .
All of this is utter nonsense. The truth is that nothing could be more “traditional family values” than the practice of plural marriage. Polygamy, or more correctly, polygyny–the marriage of multiple women to one man–not only has a long and noble tradition throughout world history, but it is currently practiced in more countries than strict monogamy is. With all the recent talk in Utah of getting back to America’s Christian roots, there is really only one defensible position on polygamy, and everyone is in agreement. Whether you are Christian, Muslim, or Hindu, you can rest assured that plural marriage is based on the firm foundation of written scripture and has the full approval of God. Ancient king-prophets such as the Biblical patriarch Jacob, Islamic founder Mohamed, and the god Vishnu all famously had numerous wives. Some modern philosophers, such as Friedrich Engels, believed that monogamy is oppressive. Considering contemporary divorce and infidelity rates, numerous scientists have also concluded that only having one sexual partner is highly unnatural. The far Right also agrees: Utah’s Libertarian candidate for Governor, Andrew McCullough, supports the decriminalization of both bigamy and gay marriage. Though Emma Smith fervently denied it and most Mormons won’t talk about it, even Joseph Smith was a highly successful polygamist. 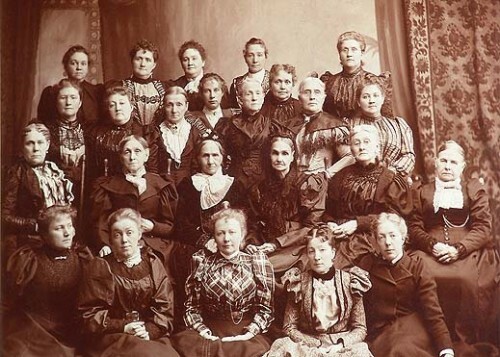 In the award-winning book In Sacred Loneliness: The Plural Wives of Joseph Smith, scholar and historian Dr. Todd Compton meticulously documents how the founder of the Latter Day Saint religion had in fact as many as 33 wives, though most of these marriages were kept secret from the public. In fact, Compton book chronicles how Joseph’s covert second marriage to 16-year old neighbor Fanny Alger was so secret that his first wife Emma did not know about until she saw them together and threw her out the house. Joseph’s sudden and secret polygamy, though well within Biblical precedent, contributed to Emma’s infamous apostasy later in life. Is this news to you? Dr. Compton is an active and respected member of the LDS faith. Consider the monogamy of Joseph Smith a myth that has been totally busted by Mormons and Gentiles alike. Utah’s most famous polygamous practitioner, of course, was an unusually maritally prolific icon of local history: Brigham Young. While Latter Day Saints tend to pride themselves with their genealogical record keeping, Young’s wives had trouble staying on the records for some strange reason. Modern scholars indicate the tally is now at 55 Contrary to the bizarre myth that polygamy was reserved for widows, only 21 of Young’s wives had never married before; 6 even had living spouses. Most of the marriages were indeed consummated, and about one half of the brides were around half his age or less at the time of the marriage. Considering the ubiquitous nature of polygamy through history and the clear documentation of its practice by revered religious leaders, it seems odd that modern Christians, especially Mormons, are so shy about their history and frequently cover it up with a clearly mythological monogamistic mindset. Besides, political maneuvering aside, mainstream Mormonism still preaches that polygamy will be practiced in heaven, so the faithful had better start warming back up to it! 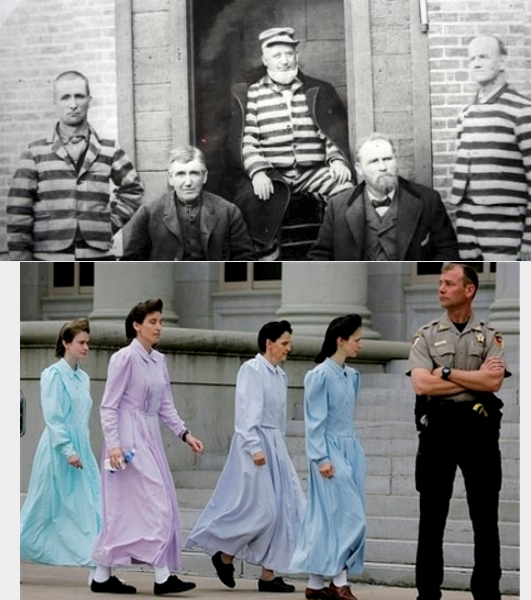 Top: Brave Mormon polygamists serving their time at the Sugar House state jail in days of yore. Bottom: New century; same crazy shenanigans! With compelling arguments like these, religion and scripture on your side, ladies, how could one possibly say no?